The New Era Pinstripe Bowl (named after its title sponsor New Era) is an annual college football bowl game in the post-season and takes place at the end of December at Yankee Stadium in New York, NY - or, to be very specific, in Bronx, NY. The 2010 game marks the birth of this college bowl game on the college football bowl schedule. It showcases the Big East team with the 3rd-best conference record against the Big 12 team with the 6th-best conference mark and after the conferences’ selections for the BCS National Championship Games are made. As part of the agreement, the post-season college football bowl game will be televised by ESPN, broadcast on ESPN Radio and can be simulcast on ESPN360.com and ESPN Mobile TV through the 2015 season. When the game was announced, Bronx Borough president Ruben Diaz Jr. joked, “If you’re looking for suggestions, maybe we should call it the Jeter Bowl.” It was unofficially referred to in the press as the Yankee Bowl, with some advocating the return of the name Gotham Bowl, which last took place on December 15, 1962. The title sponsor is the New Era Cap Company, Inc., founded in 1920, the leading head wear manufacturer and creator of New Era Apparel , brings to market products that "transcend time, culture, sport and fashion". Producing more than 35 million caps per year, New Era is the exclusive manufacturer and marketer of the official on-field cap worn by every Major League Baseball team and their Minor League affiliates. To its fans, New Era is known as the Originator of the True Fitted for its signature cap style, the 59FIFTY . The Company is headquartered in Buffalo, N.Y. 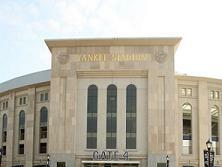 The event venue is the well-known and new Yankee Stadium, which is the home of the New York Yankees, but has been selected to host several college football bowl games, including the New Era Pinstripe Bowl. More games currently schedule for the upcoming years are Notre Dame vs. Army on Nov. 20, 2010, Army vs. Rutgers in 2011, Army vs. Air Force 2012, Army vs. Boston College in 2014 and Army vs. Rutgers in 2015. Those games will be played no earlier than Christmas and no later than New Year's Day. Buy your New Era Pinstripe Bowl Tickets now before it is too late and be one of the tens of thousands enthusiastic fans in this great stadium.